The Society of Typographic Arts (STA) curated a public art project to be displayed in the Merchandise Mart on Thursday, November 15, 2018, from 6-8pm called Chicago Characters. It will be up until the end of the year— possibly beyond. 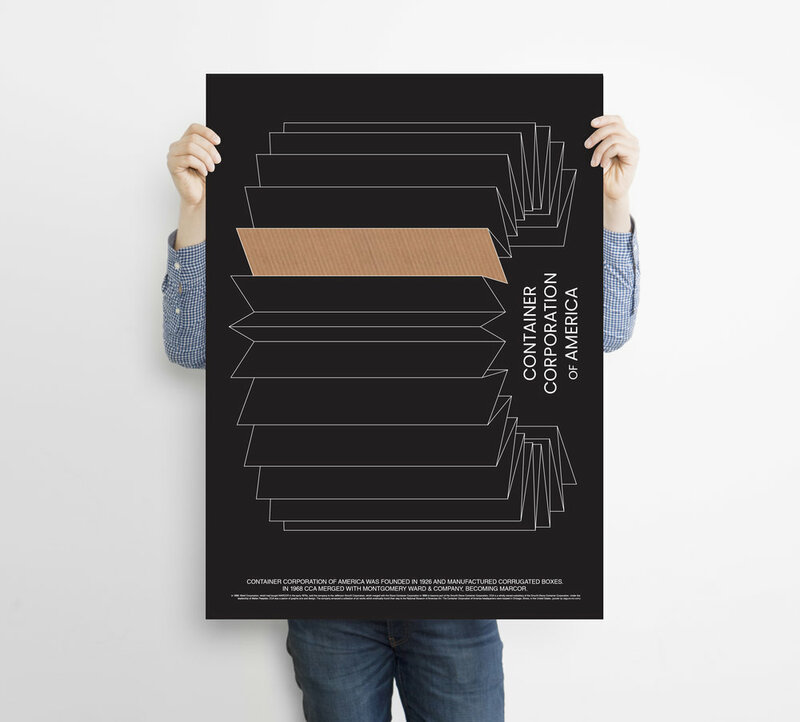 We are one of 30 talented Chicago designers/artists asked to participate, and with our piece, we chose to pay tribute to the Container Corporation of America. RSVP to the opening reception. Featuring work by: Adé Hogue, Alicia Marquez, Bart Crosby, Ben Blount, Bud Rodecker, Carlos Segura, Cody Hudson, Dana Arnett, David Lee Csicsko, David Sieren, Eileen Tjan, Jackson Cavanaugh, Jenna Blazevich, Justin Ahrens, Kira Crugnale, Kyle Letendre, Lisa Armstrong, Liz Kanter, Marcia Lausen, Maria Grillo, Matthew Hoffman, Nick Adam, Renata Graw, Rick Valicenti, Shannon Downey, Sharon Oiga, Shelby Rodeffer, Tanner Woodford, Vida Sačić, Whitney Colley. A part of ArtDesignChicago.com programming, Chicago Characters will feature 30 posters celebrating the typographic design history of Chicago. The theme for each 18x24" poster will be the marrying of a historical character in Chicago’s design history with a character of the alphabet (A-Z plus &#@‽). For example, the poster "C is for Oswald Cooper" would be inspired by Cooper, his life, or his work and would feature the letter C.
The project will tell the story of Chicago design through characters of the alphabet (a familiar and approachable subject) and past Chicago designers (a lesser known legacy)—limited to the period between 1871–2000. Designs could pay homage to the founding designers who were instrumental in introducing movements happening worldwide to Chicago, like New Bauhaus, Art Deco and Modern. Even within the design community, the history of typography and lettering in Chicago is not widely known, and this project will increase awareness of the legacy of talent we have in our city.